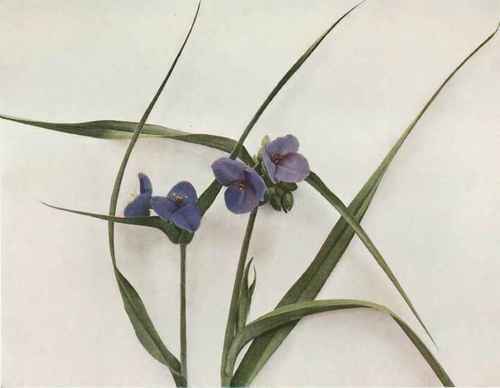 A tall, smooth or slightly pubescent plant, belonging to the same family as the Dayflower, often 1 to 3 feet tall, with long, linear or linear-lanceolate, long-pointed leaves, often a foot long and one-half to 1 inch wide, usually more or less channeled along the middle. Flowers in terminal umbels or clusters on slender pedicels, one-half to 2 inches long; blue or purplish, rarely white, 1 to 2 inches broad with three small sepals, three large, obovate, similar petals, and six equal and fertile stamens. In rich soil, mostly in woods and thickets, from southern New York, Ohio and South Dakota, south to Virginia and Arkansas. A common plant in cultivation farther north where it is a frequent escape to roadsides and fence rows. Although of great beauty, the flowers are of brief duration, and the delicate petals soon wither, the flowers being followed by others until all the numerous buds of each cluster have bloomed. With us it usually flowers in June and July or sometimes as late as August, especially since not all the stems appear to reach maturity at the same time.